We have lost a valued friend of CONTACT this year. 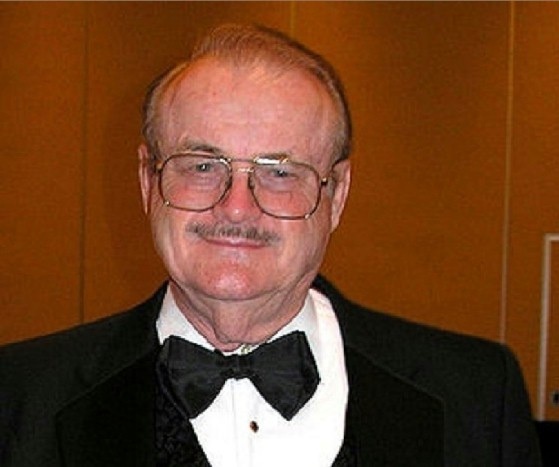 Jerry Pournelle was a singularity. Irascible and brilliant, he radiated Presence; you always knew when Jerry was in the room. He was a veteran of First CONTACT, who helped us generate the original Anthropology/Science Fiction connection. He and Larry Niven bravely introduced me to science fiction royalty at Pinckard's SF Writers' Salon and to Robert Heinlein at CONTACT. Jerry was honored as our keynote speaker in 1996. Ours was a workable and respectful friendship, polished over the years: Many bewildered early attendees remember our shouting skirmishes resounding from the balconies at after-hours conference parties (dogfights between friendlies, I called them). We disagreed loudly on politics and worldviews - but we both agreed that CONTACT was a good idea and collaborated in working and playing together. Jerry was a constant and enthusiastic advocate for our vision. Myths accreted around Jerry; he was legendary. I - like everyone who knew him - have accumulated numerous Pournelle-stories: One of my favorites, from CONTACT II, I'd like to share on this occasion with us survivors. We had retired to the hotel bar. One hot topic was the Squich's nervous system. The bipedal alien had long, triple-jointed hind legs, which, when extended, scissored out to more than twice the length of its body pod. Pournelle argued that locating the brain in the body would place it too far away to allow effectively fast nervous transmission to the hooves, which were critical not only for locomotion but also for communication (they drummed their feet and danced messages to one another). One of my students, no youngster, a gentle man who had been a programmer since the earliest days of computers, disagreed. After the decibel level of the voices rose to three figures, he brought his foot down on Pournelle's instep. As Jerry leaped up, the student said reasonably, "See. It doesn't take that long." Pournelle, never at a loss, grabbed a chair, held it out in front of him like a lion trainer, turned to me and yelled, "Funaro, call off your dog!" An award-winning science fiction writer, Jerry was a confidant of statesmen and generals, and also a pioneer in computerware, war games and RPGs, social science theory, space policy and many other fields. And always, a Friend of CONTACT. All of us will miss that bond and his unique and irreplaceable style.